When we last heard Aesop Rock he was trading bars with Homeboy Sandman on the Lice EP. 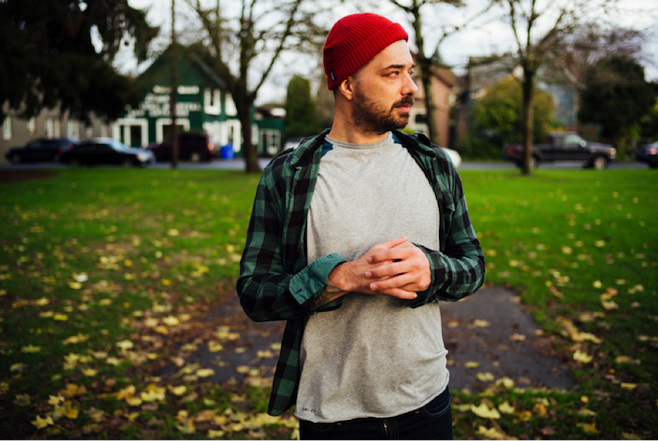 Now residing in Portland, Aesop Rock’s aesthetic has grown weirder with age as he takes the shape of parasites, names groups after Typhoid Mary, raps about cat food, and works with toy designers for undead feline figurines. To think, Bazooka Tooth was only the cusp of his indecipherable imagination. With the announcement of his forthcoming The Impossible Kid LP, Aesop Rock is finally lifting up the hood to let the voyeurs have a look inside his cranium on the video for “Rings”. Spoiler alert: Aesop Rock is powered by a tiny wooden stick figure that paints in fear of a fang-toothed, carnivorous wood slug. The follow-up to 2012’s Skelethon, The Impossible Kid is Aesop Rock’s seventh studio album and continues his self-sustainable modus operandi. Although, the record does promise to display a more personable version of the cryptic rapper, one that openly delves into bouts with depression, rocky family relationships, and the death of a friend. The Impossible Kid is out April 29 on Rhymesayers. Preorder the album here.